Mzee Emilio Odong 72 is an elderly disabled man who hails from the tiny village of Panguu in Alero sub-county, Gulu district. 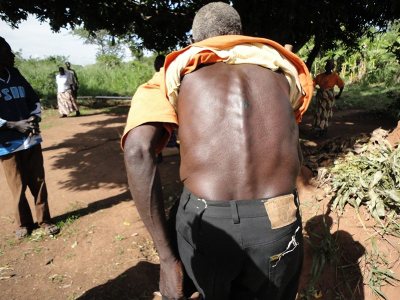 He is among the hundreds of Acholi men who were tortured and raped by the National Resistance Army ((NRA) now UPDF), when operation White Gold was carried out in 1987 during the war in northern Uganda. Mzee Odong, acrimoniously remembers how a group of about 85 soldiers clobbered him with batons, raped him and then shot his leg, because according to them, he “had allowed the rebels to cross through” his home. “They came just a few minutes after the rebels crossed my compound and they asked me why I did not stop them, but I replied, I had no power, so one beat my spinal cord with a short stick, then they raped me and the shot on my leg,” Odong said. “It took about 30 minutes while my family were witnessing haplessly, but it was a very long 30 minutes” added Odong. He said the soldiers later grabbed him by the hands and tied them behind his back (Kandooya) before being whisked to the 4th Division Military barrack in Gulu, on falsified charges that he was collaborating with the rebels. “They threw me in a hole filled with dirty water and compelled me to accept working with rebels if I wanted to survive which I denied vehemently,” he added. Odong was detained for a few days in the military establishment before he was later transferred to a police cell where he spent two months in squalid conditions. “My bone was broken, no medicine and no food, my relatives could not visit me because of fear and I was humiliated, the last thing I wanted to see was my family who witnessed me being tortured and raped. I suffered in the cells and my family had to pay tens of thousands in bribes to a police chief before I was released. I was not taken to court and I have received no apology from anyone,” Odong recalled whilst tutting. His children and wife left for Alokolum at the peak of the insurgency; he equally joined relatives in Akonyi Bedo in Paicho sub-county in Gulu. It was until 2008 when Odong re-joined his family who were already in Alokolum concentration camp, too weak to till the land; he could not work to support his family. He said he repeatedly sought the intervention of the Resident District Commissioner (RDC) who is a representative of the President over the matter without any positive steps. “I want them to compensate me any amount for what they have done to me, it’s an appeal; if they want it’s ok, if they don’t want to hear my plea, it’s equally ok, I am an old man, I haven’t got long to live.” Odong said. The RDC at the time was John Bosco Ocaya who later died with all his escorts in an LRA ambush at Cweru in Paicho sub-county while travelling from Kitgum district to Gulu. Survivors of the Mukura massacre want meaningful compensation and accountability from the UPDF officers who carried out this heinous crime, they are still alive with some serving in the Rwanda army (RPF). In Acholi, similar incidents also took place such as the Burcoro massacre in Aswa County, Gulu district where people were buried alive in a pit and then smoked to death, whilst others were hanged by the NRA at various local markets in the village. Odong says that he has longed for justice, but it has not been forthcoming. He says that now that there is relative peace, has turned his attention tilling the land with the help of his children and a community group in his village which he joined in order to access oxen and other farming utilities. His group, Wadek Mone- literary meaning we do not want disputes is mobilising efforts in the region to revitalize agro-economy and livelihood and is supported by Caritas a Catholic NGO. They have so far received Shs300million in grants under the Community Manage Disaster Risk Reduction (CMDRR) with support from CORDAID to target drought, disease, cattle raiding and water logging areas of Acholi and Teso region. were denied liberty and justice. 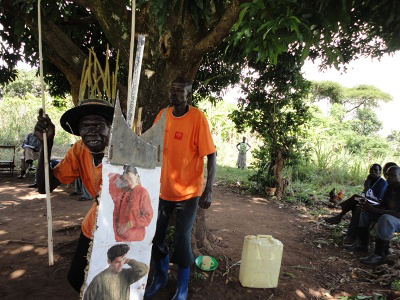 The groups being supported by Caritas in Nwoya district are Lubanga Aye Ngeyoo, Kwan Ber and Wadek Mone groups.